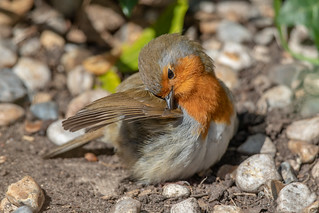 (Erithacus rubecula) My back garden. The birds are certainly making the most of the longer days and today we had a bit of sunshine for the first time in a week. Our resident robin was making the most of it, preening and sunning himself.